Dear readers — I originally wrote this piece in 2013, when I was a junior in college studying abroad in Mongolia. It’s part of a longer collection of essays that was my thesis project that semester - about Mongolian ideas around home, mother, and motherland. I’ve left the text completely unedited. You’ll hear my 22 year old self who procrastinated and wrote this during a few delirious late nights. The last image I hold of my countryside host mother was that morning I left. I was just getting onto my host father’s motorcycle, when she suddenly exclaimed something and scurried back into the ger, came back out again with her big green dipper, filled with water to bless my journey. She stood there as I arched my neck back to look at her, both of us smiling wide. Right at the moment my host father stepped on the motorcycle pedal, she let out a joyful laugh and flicked her entire arm, sprinkling a perfect stream of water towards our direction. I laughed with her, too, and on either side of me, mountains blurred and flopping fat tails of sheep scurried away. Lazy afternoons alone with her were my favorite: wind flapping at the lining, sparrows squeaking overhead. She’d sit on her bed, take out her materials for cross-stitching, and begin squinting at the needle. Or, old photographs from a wooden red drawer, photos she’s surely seen hundreds of times already. She’d motion for me to come over, explain to me the relations of this or that person. From there, we’d have a long conversation —through frequent consultation with an English-Mongolian dictionary—and I’d be ceaselessly amazed at her patience, her hands marking our relationship with dust and earth and oil stains, fingers flipping through hundreds of pages to find the simplest words that I do not know. my host father smoking a cigarette - photo taken by my friend Dimitri Staszewski, who stayed with us to film my host father (a long-song singer) for his final project, and returned again a year later. Weeks before I left for my countryside homestay, my five-year old brother from my Ulaanbaatar host family asked me, “Do you really want a Mongolian mother?” He frequently asks strange things: for example, after banging and crashing toys, “Are you scared?” and after munching on ice he picked up from the ground, “Do you want to try some?” He is the only male child and treasure of his home, “spoiled,” in the words of my UB host sister, but this particular question, of whether I wanted a Mongolian mother, stumped me. I explained, best I could, that Mongolian mothers are nice, but I do have my own mother in China. “If you have your own mother,” he reasoned, “and if you don’t want a Mongolian mother, then why are you here? Why are you living with our family?” I tell him I am just visiting. And I promise him that I will not steal his mother. Study abroad is something one does as a young, American undergraduate student because counselors and admissions booklets and peers all swear by it, in various forms, as the highlight of one’s college career. Because we young, idealistic students all want to have our lives changed, our eyes opened, by becoming one of those beaming students paraded in glossy pamphlets, shoulder in shoulder with African tribe members in Tanzania, arms spread out against sunset, sinking Venetian churches. I never believed it. I believed in the struggle of making a home, in carving out familiarity and belonging to city where one resided, and yet still I came. And now, at the end of everything, it is still difficult to articulate why. Perhaps I choose Mongolia after having watched an Inner Mongolian orphan on CCTV, Uudaam, singing a folksong of the vast grasslands of his motherland, of longing for his mother. Perhaps I choose Mongolia hoping to dust off my urban alienation, my years of shuffling between New York City, where I go to school, and Shanghai, a city I have never loved. Perhaps I choose Mongolia with another longing, as a child immigrant, having never fully reconciled my belonging to my own heritage. I wished to know what it meant to belong, so profoundly, to land, to sky, to mountains, to water, to a culture of peoples rooted in their homeland. The first time I came, the entire community must have known that we were there, American kids arriving in Landrangers jeeps, with fancy backpacks and water-purification packs and bulky cameras. 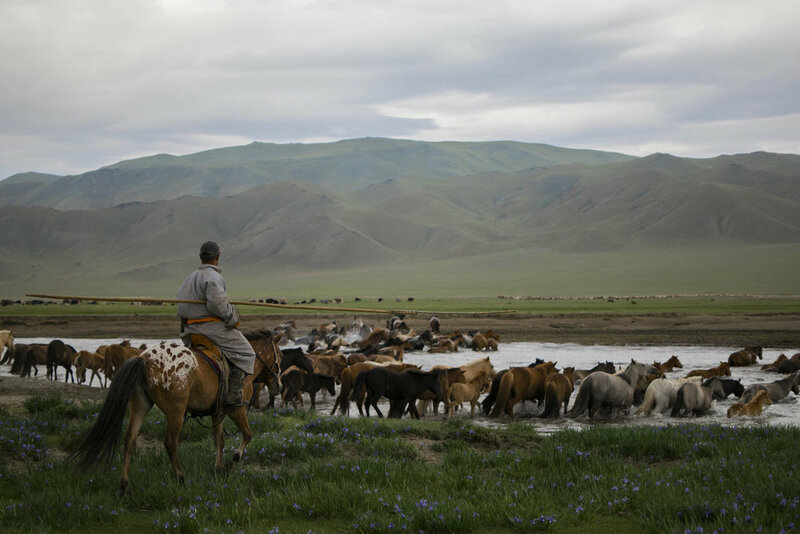 Barely able to communicate, as a Chinese American girl dropped off with a Mongolian herder family, how could I have been anything but anxious? But I never expected this: to wake up each morning in the countryside and to feel safer than I’ve ever felt in any foreign place, comforted by the warmth of my host mother’s fire, her strong voice coming from beside the stove, saying that I should sleep, sleep, sleep more. I am wrapped inside her world. This corridor of land is hers, her childhood home, stretching from this ger to across the river in the north. This land she’s treaded since birth, this horizon, stretching through generations of her past and future. Whereas most mothers in the countryside seem to have four, five, if not six or eleven children, my countryside host mother has no children of her own. Her twenty-five year old son is an adopted orphan, born out of wedlock during the democratic transition. My last afternoon, she made rice simmered in goat’s milk and tea for a late afternoon lunch. We flipped through the dictionary as it cooked, and then she ladled hot, milky rice tea into my bowl, followed by rice with yak’s cream, then tea again, until both of our faces were red and our foreheads dripped with sweat. She wiped off her face with a red cloth, and offered it to me. That afternoon, I was not studying abroad, I was not about to fly across oceans and declare my life was changed. I was there, eating, with my Mongolian mother. And as we both slid into hot afternoon dozes, we laughed at one another for sweating as if it were summer, when outside it was still a freezing spring. Thank you for reading this old piece. I’m an artist and writer spinning poetic essays about homesickness, love, and tango. You can read more of my writing here, or sign up for intimate weekly artist letters here. 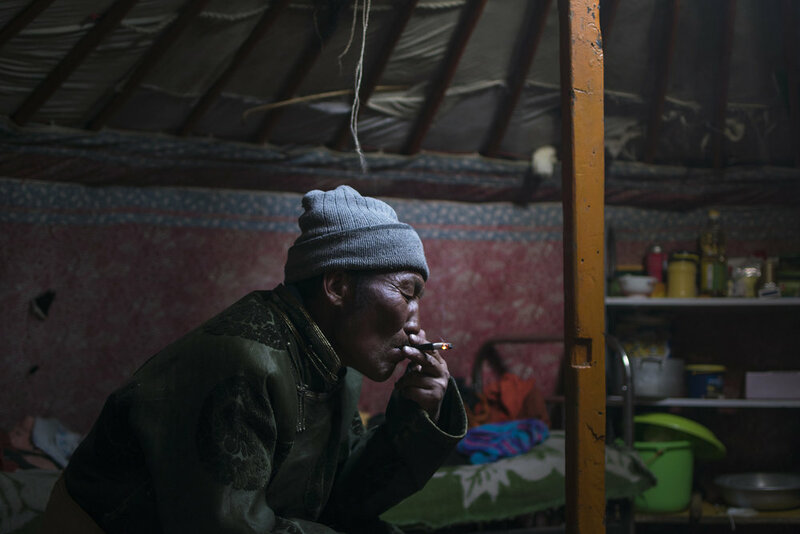 Also, if you’re interested in Mongolia, check out my friend Dimitri’s photography work. My final project was a collection of essays about Mongolian motherhood and motherland — Dimitri’s was collecting traditional Mongolian folksongs. My host father was a well-known long song singer in his community. Here’s a video Dimitri filmed of him singing to his sheep. I was there, too, when this was filmed.